If I have to go back to school, I want Claire McFall to be my English teacher. She is such fun, and so cheerful, and doesn’t hesitate to ruin Othello if the syllabus demands it. I have to admit that Claire proves I am wrong in preferring to interview authors whose work I know well. When I met her I had only read half of Ferryman – the book that went to China and was a huge success. And China does seem to be the way to go. Maybe the country could change the fates of more British YA, and children’s, authors. 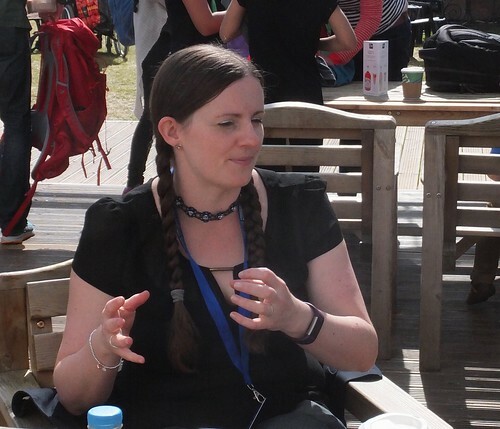 So here, only two months late, is our conversation over cookies and juice (yes, really) at the Edinburgh International Book Festival, with Claire’s thoughts on China and how to get school pupils to write. By now you all speak ‘Hygge’ don’t you? Sometimes used correctly, sometimes not. But you know about the Danish hygge. I was quite pleased when it appeared in the media, because finally, after all these years, the Resident IT Consultant understood what he’d had to put up with for so long. It made sense. I mean, I made sense. That’s all in the past, however. Now it’s about lagom, which is a very lagom kind of word. Not too much, not too little. Just right. Goldilocks, really. The most recent copy of the church newsletter from the Swedish church in London contained an interview with two Swedes who, separately from each other, had both written books about Lagom. The interviewer joked and said she felt that was lagom. Maybe. When the Resident IT Consultant returned from the library the other week, he was also bearing a Lagom book. Not one of the ones I’d read about. Seems there is no end to how lagom you can be with books about lagom. This third one, by Lola A Åkerström, contains very attractive photographs. Not sure they are terribly lagom in any sense, but never mind. And I’m not sure that lagom is a topic suitable to be written about by non-Swedes. The other two were, whereas Lola has arrived in Sweden from Nigeria via the US and Oxford. Nothing wrong with that, but as the Resident IT Consultant remarked, he felt that some of her comments about life in Sweden would also be true of many other European countries. And if you come from outside that area, you might not know. 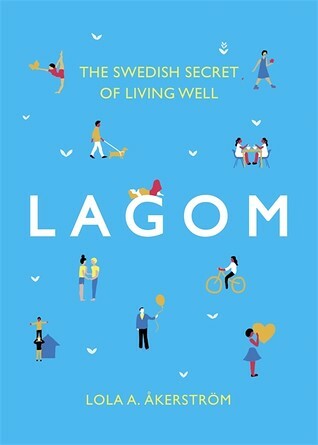 A book on lagom might be more lagom if coming from a Swede. 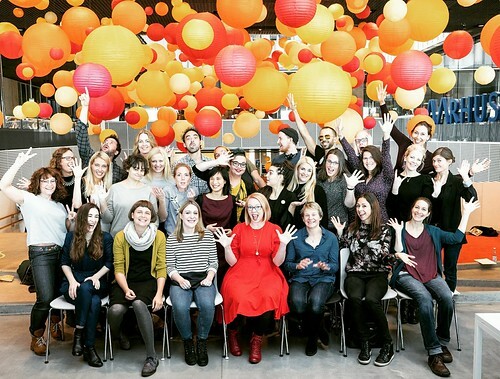 But the photos are certainly attractive to look at, and definitely more than lagom. But as I had breakfast I found myself mulling over the latest Hollywood scandal, and muttering things like ‘Meryl Streep ought to have said something much earlier.’ And I thought about my gut instinct that this sort of thing can only be dealt with if people gang up and act together, a little bit 9 to 5, if you like. And humour is always good. I recalled the aspie non-fiction book I often hark back to in my mind, where the devoted mother helped her bullied young aspie son get revenge on his bully, by carefully orchestrating a script, which used humour to deflate his opponent. After which thought, I returned to my long ago shame that I didn’t stand up for Son, who was the main victim in this business I mentioned. The Resident IT Consultant was in it too, but he can look after himself. Well, so can Son, but he’s my child and as his mother it was my duty to do what I didn’t do right then. Because I believed people could behave like adults. So here I am, having taken nothing down, instead adding to it. Because I could have, should have, been Meryl Streep. In a manner of speaking. You have probably worked out I’m talking about the book world. And some of the stars of that world were bullied by the people I mentioned. Some to an extent they felt really quite unwell. But ‘the show must go on.’ People have a living to make. It wasn’t only the stars that suffered. It was people working in related roles to do with what the book business does. The things I found out, when they’d ascertained I wasn’t with the other side! Someone soldiered on with her job, because she had to. Another said quite tartly that yes, she had had dealings with X and knew how to handle him/her. Yet another person, someone I’d felt was very collected and cool and no pushover, had asked to be moved somewhere else. It’s easy to say that I’m reading the wrong thing into these types of comments, which is why I was heartened to personally meet a star who had never met these people and didn’t know about my own problems. In a separate discussion, geographically far removed from it all, apparently the gathered stars had ended up talking about this business. And they have a nickname for X; one that is both simple and oh, so apt. We are all Meryl Streep. 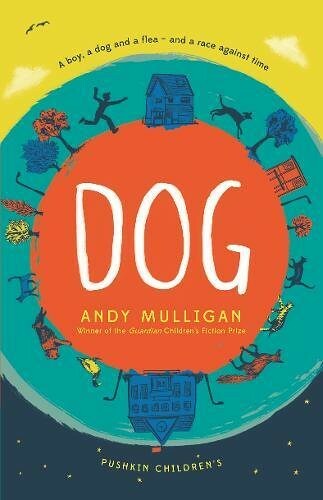 Brilliant, but darker than Andy Mulligan’s other books, Dog is a heartwarming tale about a dog and his boy. Unlike some others, this one goes slightly more wrong when things go wrong, so I was fascinated to discover in the acknowledgements that Dog ’emerged after a more sombre novel had withered and died.’ I wonder what our usually so light and amusing Andy has been up to? Dog is the last of the litter, not claimed by anyone, on account of him looking so weird. Which is why he only finds his boy when he’s actually given away for free. Money is a problem in Tom’s broken family, and when more things break, that means the problem gets worse. They can’t afford the mishaps that go with a puppy. A happy puppy, now that he’s found his Tom, but still rather accident-prone and someone who thinks after the deed. This book deals with bullying; both Tom’s at school, and to some extent Dog’s (he’s called Spider…) at the hands of a spider, and a cat. It’s lucky that all the animals can talk to each other. Or maybe not. Spider believes the best of nearly every animal he meets. Who even knew fleas could be this lovely? Finding this kind of love should be an encouragement to many readers – and their dogs – that life can improve. Both Tom and Spider make mistakes, as do the adults around them, but most problems can be sorted. Maybe not McKinley’s, though. That was rather a nightmare. As was the moth’s treatment by the spider (not the dog Spider!). It’s life. Or more appropriately, death. It’s funny how, looking back, you don’t know what is to come. Spring 2009 I didn’t know the Grants; Helen and Michael. And no, they are not a couple. Helen has her Mr Grant, and Michael isn’t actually a Grant. I connect both of them with Germany. 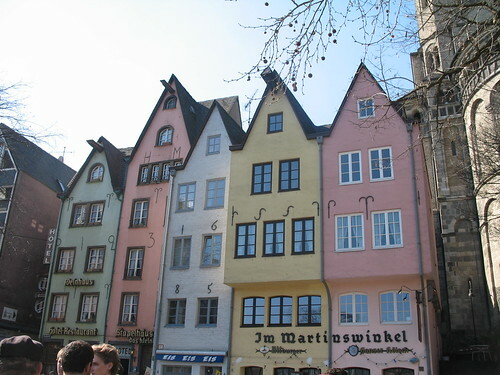 Helen had lived in Germany for many years, and her first book – The Vanishing of Katharina Linden – was set there, in Bad Münstereifel; not too far from Köln and Bonn. Because that’s where Daughter and I were heading, that weekend in March 2009, and I was reading Helen’s book on the plane, and I’d just got to the bit where one of the ‘innocent’ characters says ‘Scheisse.’ It made me giggle. Childish, I know. Anyway, it was good reading a book set in Germany when I was actually in Germany. I mean, above Germany. When Daughter and I had done what we came for, which was to attend a Roger Whittaker concert in Köln, which was great, and made greater still by being preceeded by an interview with Roger, we went to visit an online friend near Bonn. I had a suitcase full of books for her, because you have to get rid of books somehow. One of those books was Michael Grant’s Gone, the first in the Gone series. And I only gave it away, because I had been sent two copies. My friend liked the look of it so much that she read it almost there and then. Although, being a writer herself she went on to pick the plot to pieces and had opinons on almost every aspect. But that’s fine. So, The Vanishing and Gone – both books about disappearing – were my first meetings with Helen and Michael. And now, I’ve read so much more by them, and seen so much more of them, that they feel like old established friends. Helen lives relatively near me, and Michael is so successful that he’s over in Britain most years, and sometimes more than once. But it began in that plane, with a Scheisse, and a spare book.